India made a hat trick by winning the Kabaddi world cup 2016. The finals was played at the Arena by TranStadia at Gujarat, between India (Captain- Anup Kumar) and Iran (Captain- Meraj Sheykh) and India won this match by the score of 38-29. NABARD (National Bank for Agriculture and Rural Development) sanctioned a loan of INR 19,702 crore to NWDA (National Water Development Agency) which will provided to it under NABARD’s long term irrigation fund (LIFT). This loan is sanctioned to develop 50 irrigation projects from 11 states. First time, in the mangrove forest situated near the Krishna Wildlife Sanctuary (Andhra Pradesh) a smooth-coated otter (Lutrogale Perspicillata) was sighted. Presence of otter indicates the rise in mangrove forestation. Otter has been categorised as vulnerable in the red data book of International Union for Conservation of Nature (IUCN). UDAN (Ude Desh ka Aam Nagrik) scheme has been launched by the Union Government with a view to strengthen regional air connectivity. Union Civil Aviation Minister Mr. Ashok Gajapati Raju launched the scheme at New Delhi. The implementation work will begin by January 2017 and will be in operation for a period of 10 years. Under this scheme, Airline operators will have to bid for up to 40 subsidised seats and minimum 9 There will be 50% seats on market based pricing. It aims to increase the ticketing volume to 300 million by 2022. 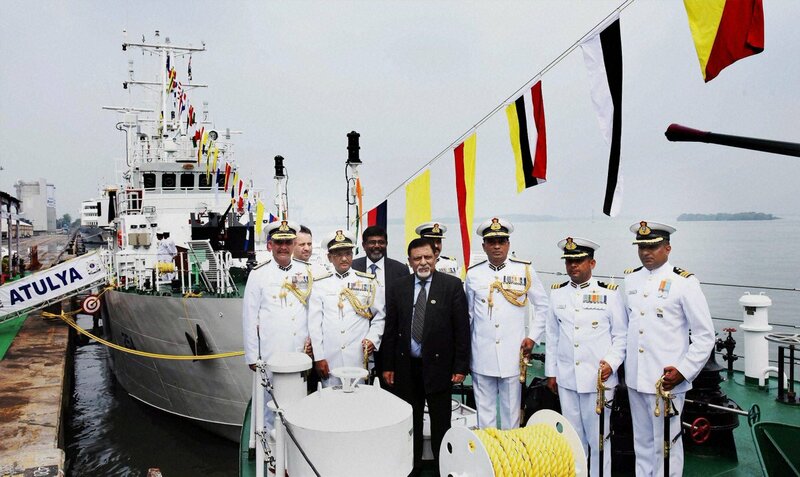 Aryaman and Atulya, two Indian Coast Guard Ships (ICGS) were commissioned into Indian Coast Guard in Kochi, Kerala. ICG (HQ- Delhi) was established on 18th August, 1978 under the Coast Guard Act of 1978. The first ever global conference in order to strengthen Arbitration and Enforcement in India was held at New Delhi. It is a 3-Day event, inaugurated by Hon’ble President Pranab Mukherjee on 21st October, 2016. 1. The Krishna Wildlife Sanctuary is situated in which state? 2. Where is the headquarters of Indian Coast Guard? 3. Who is the runner-up of Kabaddi World Cup 2016? 4. Who among the following launched he UDAN scheme? 5. What does NABARD stand for?